Sounds and looks amazing! Can we sub almond milk for the 2% milk? yes, would love to know as well! I used unsweetened almond milk and it came out awesome! Be sure to use the correct wild rice though! I used a wild rice blend yesterday and soy milk and it didn’t really work well. Today I used the correct wild rice and almond milk and it’s amazing! I used almond milk & non-dairy butter (same amounts as the recipe) and made the whole thing vegan. It was a hit! Thanks for veganizing it! I’going to try it! Our family tradition on Christmas Eve (since before I was born I think– 32 years strong) was to eat my Grandmother’s beef barley soup. Not quite wild rice, but a close relative! We always have it with the brisket from the soup and challah bread and it’s the. most. comforting. Thank you for this recipe! 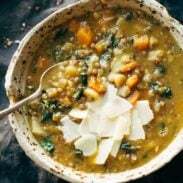 I love this soup, but I would also love your grandmother’s beef barley recipe!!! That sounds amazing right now. We have a hard frost today and sounds so nourishing and comforting. I’m finally learning that the simple, passed down recipes turn out to be the best. OK, I’m entering Instant Pot territory and Lindsay made me do it. Which one am I buying? Thanks! We are also a family of 5, with three teenagers. Amazon here I come. 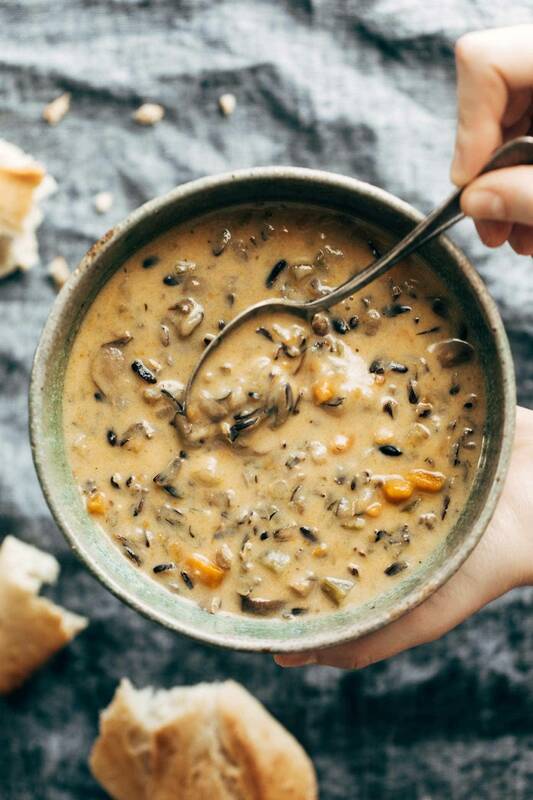 You can never have enough wild rice soup! 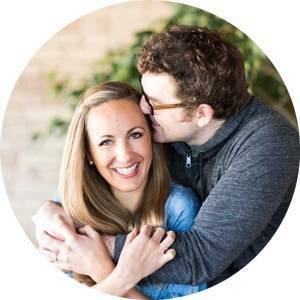 I am still wondering how it will beat your crockpot wild rice soup…I am a diehard fan…so….will report back. My grandma always made beef barley soup for Christmas dinner. Now I do and forever will. Nothing better. This just looks like comfort in a bowl! 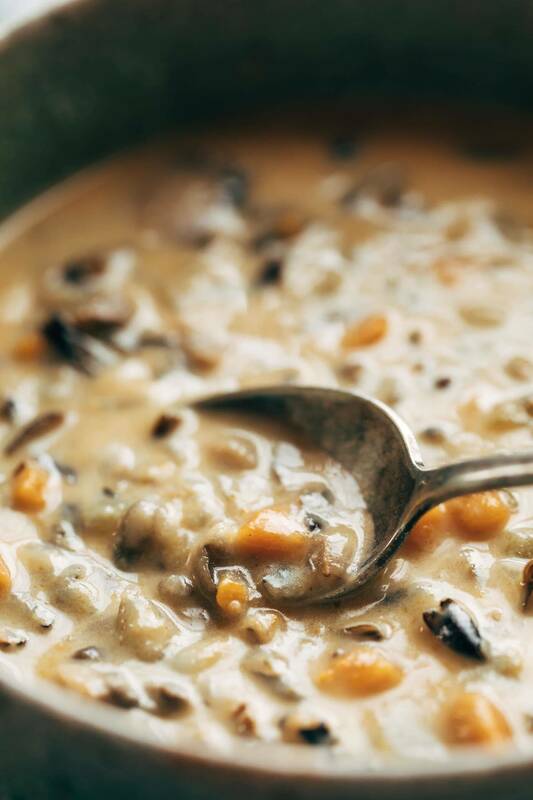 I LOVE creamy wild rice soups, but never attempted myself….I think it’s just about time. I’ve been hooked on squash and pumpkin soups (www.behindtheplates.com) but I’ll be adding this one into the mix! Ohh I’ve been a mushroom hater for soooo long but this might change my mind! OK I am ready to buy an Insta pot!!! Stood in the store for half an hour trying to decide between 6 and 8 qt. How did you decide, which do you have, and are you happy with your choice? Thanks a million! sorry but think the 8-quart is the way to go. does not take up that much more space and it is always easier to down size contents then to attempt to fit large amount into a small bowl. In your first paragraph you talked about your mom making this on Christmas eve and the smell of bacon in the house. I would love to see that recipe too!! Would like bacon recipe mushroom soup. Sounds amazing! I found my wild rice at Whole Foods! Yep! Our Minnesota family enjoys wild rice soup at Christmastime as well. Looking forward to trying this recipe in my IP. 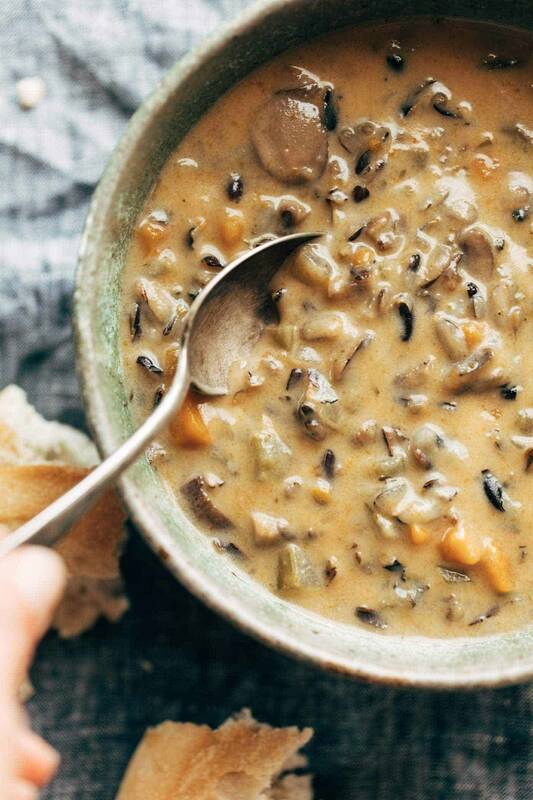 OMG I just made your Crockpot Chicken Wild Rice Soup last night… and it was AMAZING. Definitely need to try this recipe ASAP. OMG – I have to admit, not a huge fan of wild rice . . . but I may be a convert. Am going to try this and report back. Everything about it sounds yummy. Now if it would just get cold enough for soup!!!!! I am so ready for a hearty bowl of soup! Thank you! It tastes like a hug in a bowl. I love it. I made it vegan by subbing cashew milk and vegan butter for the roux. I love it it tastes like a recipe I already make with the ease of the instant pot. I was just going to ask how I might make this more vegan. I am more of a “flexitarian” in my eating, I am really trying to cut out white flour and most dairy. did you sub 1:1 of the amounts for both? I have never tried vegan butter before. Thanks! would love to know too! what brand of cashew milk did you use? Is 45 minutes high pressure the right cook time? It seems like a long time for an instant pot ? Lisa, I made this last night and thought the same. But I did cook it for the 45 minutes, and it turned out great! I had the same doubt, but followed the recipe since it was my first time making it. I ended up with more of a tasty mush than a soup. Perhaps it is due to the type of wild rice, or whether it is broken (as mine was) but next time I think I will halve the cooking time. Yeah. Mine came out all mushy too:-( Usually when I’m making rice in the instant pot I only cook it for 5 minutes. I just tried this deliciously looking recipe. The taste was straight on point! But the consistency unfortunately wasn’t. It turned out so mushy and thick…I followed the exact recipe except for the type of rice. I used the wild rice blend. Could that be it? The recipe says specifically NOT to use a wild rice blend! I had the same problem. Way overcooked. If it’s way overcooked, you’re likely using the wrong type of wild rice. My aunt from MN sends us wild rice, and I have to cook it almost 70 minutes to get it soft enough (we are at a higher elevation, so have to go that little extra time). If it’s whole, natural wild rice, it shouldn’t be mushy!!! Mine was mushy as well and very bland. Smelled great but had no flavor. I almost think it needs double the seasonings. It was actually better before I added the butter/flour/milk mixture. I was super excited to make this and ended up disappointed.